6-ounce, 50/50 cotton/polyMoisture wicking propertiesHeat transfer labelContoured welt knit collar and cuffs3-button clean-finished placket with reinforced bottom boxWood-tone buttonsDouble-needle hemCARE INSTRUCTIONSMachine wash warm, inside out, with like colors. Only non-chlorine bleach. Tumble dry medium. Do not iron if decorated. Do not dry clean. IZOD Ultra Wicking Pima Cool Short Sleeve Sport Shirt. 58% cotton/42% polyester 6.0 ounce pima cool sport shirt. Augusta Sportswear Wicking Mesh Sport Shirt. 100% polyester wicking closed hole mesh sport shirt. 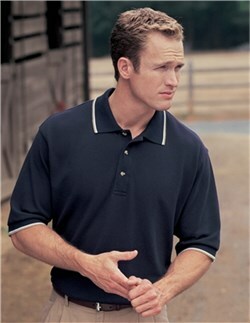 Hanes Stedman Blended Jersey Sport Shirt. Pre-shrunk 50% cotton/50% polyester 5.5 ounce jersey knit sport shirt. 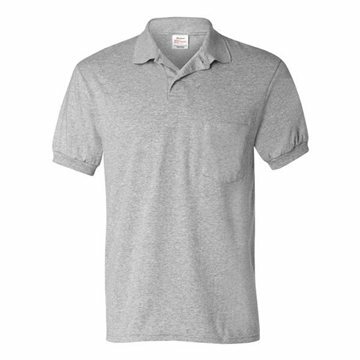 Hanes Stedman Blended Jersey Sport Shirt with a Pocket. Pre-shrunk 50% cotton/50% polyester 5.5 ounce jersey knit sport shirt. 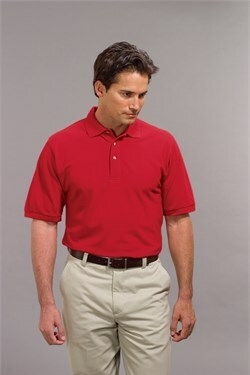 5.5 oz., 50/50 jersey-knit tubular golf shirt with left chest pocket. Two-button Allen Solley placket with pearlized buttons. Welt collar and ribbed cuffs. Double-needle stitched hemmed bottom. Generous cutAvailable in Small, Medium, Large, XL, 2XL & 3XL! 100% preshrunk ringspun cotton tubular sport shirt. Welt collar. Double-needle stitched hemmed bottom. men. Welt cuffs. Two-button clean-finished placket with wood-tone buttonsAvailable in Small, Medium, Large, XL & 2XL! Supplies are Limited!100% cotton jersey-knit tubular sport shirt (Birch is 99/1 cotton/poly). Taped welt collar and welt cuffs. Three-button continental placket with horn buttons. Double-needle stitched hemmed bottom. adultAvailable in Small, Medium, Large, XL & 2XL! 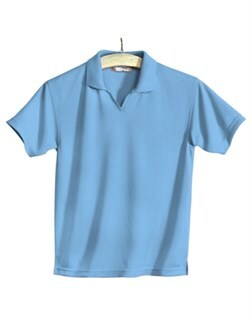 Full-cut 50/50 cotton/polyester jersey, with stain resistant finish. Two button continental placket with pearlized buttons. Welted collar and rib knit sleeve bands. Double-needle hemmed bottom. Tubular body. Available in Small, Medium, Large, XL, 2XL & 3XL! Our renowned pique knit sport shirt is soft, casual and a tried-and-true customer favorite. With an abundance of colors, this shrink-resistant sport shirt is easy to care for and just gets better looking over repeated washing and wear. Quite simply, youd be hard pressed to find a better pique knit sport shirt that meets our impeccable standards. Heavyweight pique. Preshrunk 100% ring spun combed cotton.Available in X-Small, Small, Medium, Large, XL, 2XL, 3XL, 4XL, 5XL & 6XL! This soft, garment washed sport shirt makes whatever comes your way a breeze. The breathable mesh weave helps keep you cool while the cotton knit assures you look it. 100% ring spun combed cotton. Double-needle stitching. Flat knit collar and cuffs. 3-button placket with horn-tone buttons. Available in X-Small, Small, Medium, Large, XL, 2XL, 3XL, 4XL, 5XL & 6XL! Few can resist the delightfully soft hand and lightweight honeycomb knit texture of our 100% Pima cotton sport shirt. Crafted with 100% Supima® Pima cotton-one of the highest grades of cotton in the world-this sumptuous shirt is consistently a top seller! Available in 14 colors, youre sure to find just the right one for your needs. 100% extra-long staple Supima Pima cotton. Double-needle stitching. Flat knit collar and cuffs.Available in X-Small, Small, Medium, Large, XL, 2XL, 3XL, 4XL, 5XL & 6XL! A top performer when you need to stay cool and confident! Soft and breathable, this baby pique sport shirt has our exclusive Rapid Dry moisture wicking technology. The unique knit wicks moisture away from the body to the shirts surface where it quickly disperses and evaporates. 60/40 cotton/poly. Double-needle stitching. 3-button placket. Available in X-Small, Small, Medium, Large, XL, 2XL, 3XL, 4XL, 5XL & 6XL! Our Dri-Mesh double mesh cooling technology combines with a tipped collar and piping for a comfy sport shirt that not only performs...but looks great too! 100% polyester double mesh. Taped neck. Striped placket and collar.2-button placket with pearlized buttons. Double-needle stitching on shoulders and hem. Available in X-Small, Small, Medium, Large, XL, 2XL, 3XL & 4XL! Take the sweat out of working at high speeds or humidity. Advanced double poly mesh has all the advantages of lightweight moisture wicking and breathability in a classic style thats full of confidence. 100% poly double mesh. Double-needle stitching on armholes, shoulders and hem. Available in Small, Medium, Large, XL, 2XL, 3XL & 4XL! Heavyweight pique offers durability and long-term wear. Garment washed for a soft feel and reduced shrinkage. Full cut for easy movement and a relaxed fit. 100% ring spun combed cotton pique. Double-needle stitching. Welt collar. Pewter-tone buttons.Available in X-Small, Small, Medium, Large, XL, 2XL, 3XL, 4XL, 5XL & 6XL! A top performer when you need to stay cool and comfortable! Now available with long sleeves, this soft, breathable baby pique sport shirt has our exclusive Rapid Dry moisture management technology. The unique knit wicks moisture away from the body to the shirts surface where it quickly disperses and evaporates. 60/40 cotton/poly. Double-needle stitching.Available in X-Small, Small, Medium, Large, XL, 2XL, 3XL & 4XL! The contrast trim on the collar gives this baby pique sport shirt a sophisticated look while Rapid Dry technology expertly manages moisture. The result? You look great and feel great too. 60/40 cotton/poly. Double-needle stitching.3-button placket with contrast color. Available in X-Small, Small, Medium, Large, XL, 2XL, 3XL & 4XL! The superb feel of interlock knit is striking on its own. Add in the subtle glow of jacquard knit shadow stripes and you have one of our most intriguing styles to date. A classic in fit and construction, this shirt takes a break from the ordinary with dashing, modern design. 58/42 cotton/poly interlock is easy care. 3-button placket with pearlized buttons.Available in X-Small, Small, Medium, Large, XL, 2XL, 3XL & 4XL! A favorite for travelers, this luxurious sport shirt keeps you cool and comfortable with moisture-wicking PimaCool technology. Especially good for warmer climates and summer wear, this sport shirt is easy to care for and feels great against your skin. 55/45 cotton/poly. Double-needle stitching. Mesh-backed fabric for breathability. Grosgrain trim accents on placket and inside neck.Available in X-Small, Small, Medium, Large, XL, 2XL, 3XL & 4XL! Our new Bamboo Blend Pique Sport Shirt is made from fabric originating from bamboo for exceptional breathability and comfort. With an earth-conscious bamboo blend, this sport shirt is also antimicrobial, UV-resistant and odor inhibiting. Beyond that, is also helps regulate body temperature and wicks moisture so you stay dry and confident all day long. 68/32 poly/poly from bamboo charcoal. UPF rating of 50.Available in X-Small, Small, Medium, Large, XL, 2XL, 3XL & 4XL! A tried-and-true customer favorite, our comfortable classic sport shirt is anything but ordinary. With a silky smooth hand and easy care blend, its a first-rate choice for uniforming just about any group. 65/35 poly/cotton pique. Double-needle armholes and bottom hem. Available in 7XL, 8XL, 9XL, 10XL! A customer favorite for years, the Silk Touch sport shirt is soft, supple and easy to care for. The silky smooth pique knit resists wrinkles while the classic long sleeve style looks great on everyone. 65/35 poly/cotton pique. Flat knit collar and cuffs.Available in X-Small, Small, Medium, Large, XL, 2XL, 3XL, 4XL, 5XL & 6XL! With true classic style, our lightweight Ottoman Sport Shirt will keep you looking great at any corporate event. Our exclusive Dry Zone moisture wicking technology takes moisture away from your skin-and off your mind. 100% polyester. Flat knit collar. 2-button placket with dyed-to-match buttons. Raglan sleeves for ease of movement. Shrink resistant.Available in X-Small, Small, Medium, Large, XL, 2XL, 3XL, 4XL, 5XL & 6XL! 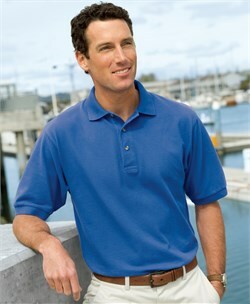 This sport shirt upholds the exceptional quality and value youve come to trust from Port & Company. 100% colorfast cotton. **ASH - 99/1 Cotton/Poly. Welt collar and hemmed sleeves. 2-button placket. Double-needle sleeve and hem. Available in Small, Medium, Large, XL, 2XL, 3XL & 4XL! 50/50 cotton/poly. Welt collar and rib cuffs.2-button placket. Available in Small, Medium, Large, XL, 2XL & 3XL! 100% ring spun cotton. Roomier cut for comfort. Welt collar and cuffs. 3-button placket, clean finished with reinforced bottom box. **ASH-99/1 Cotton/Poly****Sport Grey-90/10 Cotton/Poly**Available in Small, Medium, Large, XL & 2XL! 50/50 cotton/poly with SpotShield stain resistance. Five-point pocket on left chest.2-button placket. Seamless body with double-needle sleeves and hem. Available in Small, Medium, Large, XL, 2XL & 3XL! 100% ring spun cotton for comfort. Welt knit collar and sleeve bands. 2-button placket. Wood-tone buttons. Seamless body with double-needle hem. **Birch-99/1 Cotton/Poly** Available in Small, Medium, Large, XL, 2XL & 3XL! Strategically placed ventilation panels take the ultra-dry technology of Dri-Mesh to the pro level. This advanced mesh design truly performs by removing a major obstacle to comfort-sticky perspiration. Stretch-enhanced gussets boost the overall mobility and breathability of this hi-tech shirt. 95/5 poly/spandex stretch mesh panels and locker patch.Available in X-Small, Small, Medium, Large, XL, 2XL, 3XL & 4XL! Our renowned pique knit sport shirt is soft, casual and a tried-and-true customer favorite. With an abundance of colors, this shrink-resistant sport shirt is easy to care for and just gets better looking over repeated washing and wear. Quite simply, youd be hard pressed to find a better pique knit sport shirt that meets our impeccable standards. Heavyweight pique. Preshrunk 100% ring spun combed cotton.Available in Large, XL, 2XL, 3XL & 4XL! A tried-and-true customer favorite, our comfortable classic sport shirt is anything but ordinary. With a silky smooth hand and easy care blend, its a first-rate choice for uniforming just about any group. 65/35 poly/cotton pique. Knit collar and cuffs.Double-needle armholes and bottom hem. Metal buttons with dyed-to-match rims. Available in Large, XL, 2XL, 3XL & 4XL! 100% polyester with UV and anti-microbial finish; CoolMax® Active jersey; rib knit collar; open-hem sleeve; contrast adidas brandmark on back neck yoke; lower side vents; ClimaLite® heat-seal logo on lower left backAvailable in Small, Medium, Large, XL, 2XL & 3XL! 100% polyester with moisture-wicking finish; crew neck with contrast three-stripes fabric applique on shoulders and sleeves; open-hem sleeves; embroidered contrast brandmark on lower left hem; open-bottom hem with vents on lower sideseams; ClimaLite® heat-seal on lower back left sideAvailable in Small, Medium, Large, XL, 2XL & 3XL! If your teams like ours, youll love SpotShield. 50% cotton/50% polyester Double-needle hem Pearlized buttons on continental placket Stain-resistant SpotShield Woman?s tailored fit Available in Ladies Small, Ladies Medium, Ladies Large & Ladies XL! If your teams like ours, youll love SpotShield. 50% cotton/50% polyester Double-needle hem Pearlized buttons on continental placket Stain-resistant SpotShield Rib-knit cuffs reinforced with spandex Available in Small, Medium, Large, XL & 2XL! Be bold, be comfortable. JERZEES pique.50% cotton/50% polyester Stain-resistant SpotShield Continental placket Pearlized buttons Hemmed sleeve bands Available in Small, Medium, Large, XL & 2XL! It?s time to blend comfort and style. 50% cotton/50% polyester Contoured welt collar and sleeve bands Double-needle hem Wood-tone buttons Quarter-turned to eliminate center crease Available in Small, Medium, Large, XL, 2XL & 3XL! 100% spun polyester pique. Three horn buttons, clean-finished placket, bottom hem with side vents, half-moon yoke. Double-stitched for added strength. 2? extended tail. Meets ANSI 107-2004 requirements for background fabric. Available in Small, Medium, Large, XL, 2XL, 3XL, 4XL, 5XL & 6XL! 100% spun polyester pique. Three horn buttons, clean-finished placket, bottom hem with side vents, half-moon yoke. Double-stitched for added strength. 2? extended tail. Meets ANSI 107-2004 requirements for background fabric. Available in Large, XL, 2XL, 3XL, 4XL, 5XL & 6XL! Women?s 60% cotton/40% polyester Premium Quality Venice short sleeve pique knit golf shirt . Features a v-neck collar and a square hemmed bottom with side vents. Available in X-Small, Small, Medium, Large, XL, 2XL, 3XL & 4XL! 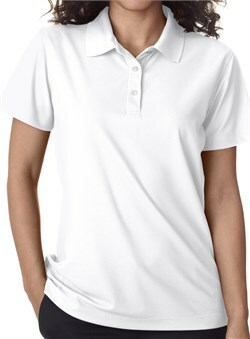 The Premium Quality Ladies Contour Sport Golf Shirt is a 60% cotton/40% polyester short sleeve pique knit golf shirt . The Contour features three horn buttons set in a reversed placket. Square hemmed bottom. Available in X-Small, Small, Medium, Large, XL, 2XL, 3XL & 4XL! Find the Stamina to take on anything that comes your way in this premium quality women?s 100% polyester waffle knit shirt, featuring the UltraCool™ system to control and manage perspiration. Accented with a fitted silhouette cut with a self-fabric collar and narrow 6-button placket. Small capped open sleeves, square bottom with side vents and contrast piping along inner back neck.Available in X-Small, Small, Medium, Large, XL, 2XL, 3XL & 4XL! Active lives require Ambition . Women?s 100% spun polyester premium quality micromesh sport golf shirt . Features the UltraCool system, developed to control and manage perspiration. Accented with a Johnny collar, square bottom with side vents and open cuffs. Available in X-Small, Small, Medium, Large, XL, 2XL, 3XL & 4XL! 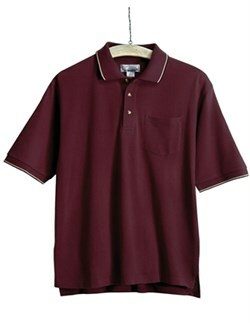 Men?s 60% cotton/40% polyester short sleeve pique golf shirt with clean-finished placket and three horn buttons. Features a hemmed bottom with side vents and a half-moon yoke. 2? extended tail. Available in Small, Medium, Large, XL, 2XL, 3XL, 4XL, 5XL & 6XL! 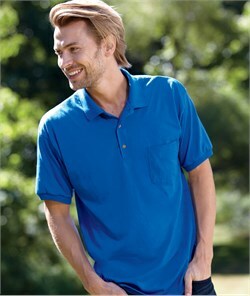 Men?s 60% cotton/40% polyester short sleeve pique golf shirt with clean-finished placket and three horn buttons. Features a hemmed bottom with side vents and a half-moon yoke. 2? extended tail. Available in Large, XL, 2XL, 3XL, 4XL, 5XL & 6XL! Whatever comes your way, there?s no need to sweat it.The Endurance waffle knit golf shirt is constructed of 100% polyester, and features the UltraCoolTM system to control and manage perspiration. Accented with a narrow 3-button placket, self-fabric collar and cuffs and square bottom with side vents. Khaki contrast piping along inner back neck. Available in Small, Medium, Large, XL, 2XL, 3XL & 4XL! 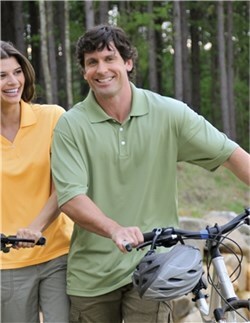 100% spun polyester micromesh golf shirt. Features the UltraCool™ system, developed to control and manage perspiration. Accented with a three-button placket, half-moon yoke back, and square bottom with side vents. Open cuffs. Available in Small, Medium, Large, XL, 2XL, 3XL & 4XL! 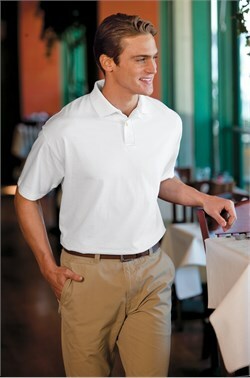 100% spun polyester micromesh golf shirt. Features the UltraCool system, developed to control and manage perspiration. Accented with a three-button placket, half-moon yoke back, and square bottom with side vents. Open cuffs.Available in Large, XL, 2XL, 3XL, 4XL, 5XL & 6XL! Womens Premium Quality 100% polyester textured jacquard 1/2 zip pullover sport shirt . features Ultra Cool moisture wicking technology. Contrast piping along front and back body, collar and placket. Mandarin collar and 3/4 sleeves . Available in X-Small, Small, Medium, Large, XL, 2XL, 3XL & 4XL! Women?s 60% cotton/40% polyester Premium Quality Ladies Journey Sport Golf Shirt . Special mesh knit stimulates air circulation. Featuring the UltraCool™ system, developed to control and manage perspiration. Two-tone trim Johnny collar and cuffs. Square bottom with side vents. Available in X-Small, Small, Medium, Large, XL, 2XL, Plus 1X & Plus 2X! 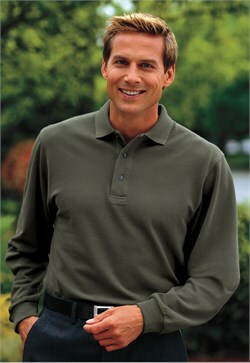 Men?s 60% cotton/40% polyester golf shirt. Special mesh knit stimulates air circulation. Featuring the UltraCool™ system, developed to control and manage perspiration. Two-tone trim collar and cuffs. Three horn buttons and half-moon yoke back. Clean-finished placket, bottom hem with side vents and 2 extended tail. Available in Small, Medium, Large, XL, 2XL, 3XL, 4XL, 5XL & 6XL! Men?s 7.8 oz. 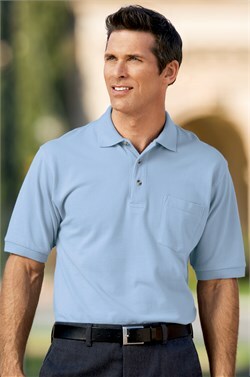 60% cotton/40% polyester golf shirt. Special mesh knit stimulates air circulation. Featuring the UltraCool system, developed to control and manage perspiration. Two-tone trim collar and cuffs. Three horn buttons and half-moon yoke back. Clean-finished placket, bottom hem with side vents and 2 extended tail. Available in Large, XL, 2XL, 3XL, 4XL, 5XL & 6XL! 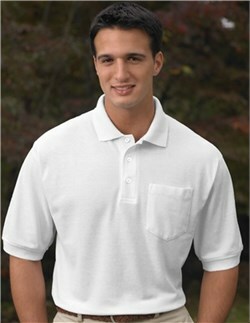 Men?s 60% cotton/40% polyester golf shirt with pocket. Special mesh knit stimulates air circulation. Featuring the UltraCool™ system, developed to control and manage perspiration. Two-tone trim collar and cuffs. Three horn buttons and half-moon yoke back. Clean-finished placket, bottom hem with side vents and 2 extended tail.Available in Small, Medium, Large, XL, 2XL, 3XL, 4XL, 5XL & 6XL! The perfect men?s pique golf shirt combining the easy care of a 60% cotton/40% polyester blend with 3M™ Scotchgard™ protection to resist stains. Constructed with a clean-finished placket and three horn buttons. Contrasting trim on collar and cuffs. Features a hemmed bottom with side vents and a half-moon yoke. 2? extended tail. Available in Small, Medium, Large, XL, 2XL, 3XL, 4XL, 5XL & 6XL! Keeping your cool regardless of conditions requires Vision . This premium quality Women?s vision 100% polyester pique golf shirt features the UltraCool system to control and manage perspiration. Constructed with one-button ?Y? neckline, mesh side panels, and open cuffs. Square bottom with side vents. Available in X-Small, Small, Medium, Large, XL, 2XL, 3XL & 4XL! Go after everything you want with Vigor. 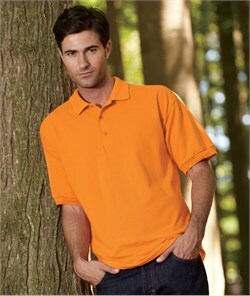 This Men?s 100% polyester pique golf shirt features the UltraCool™ system to control and manage perspiration. Constructed with a three-button placket, mesh side panels, and open cuffs. Half-moon yoke back and square bottom with side vents. Available in Small, Medium, Large, XL, 2XL, 3XL & 4XL! Go after everything you want with Vigor. 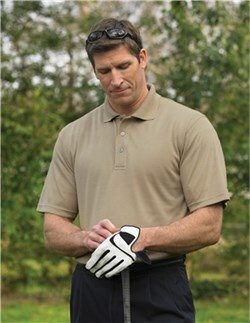 This Men?s 100% polyester pique golf shirt features the UltraCool system to control and manage perspiration. Constructed with a three-button placket, mesh side panels, and open cuffs. Half-moon yoke back and square bottom with side vents. Available in Large, XL, 2XL, 3XL, 4XL, 5XL & 6XL! 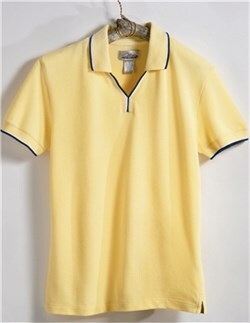 The Premium Quality Ladies Autograph Sport Golf Shirt is Specially cut for women. 8.2 oz. 100% combed cotton pique golf shirt . Three horn buttons in reversed placket. Square bottom. Available in X-Small, Small, Medium, Large, XL, 2XL, 3XL & 4XL! Men?s 100% combed cotton pique. Three horn buttons. Clean-finished placket and bottom hem with side vents. Half-moon yoke. Double-needle stitched for added strength. 2? extended tail. Available in Small, Medium, Large, XL, 2XL, 3XL & 4XL! Men?s 100% combed cotton pique. Three horn buttons. Clean-finished placket and bottom hem with side vents. Half-moon yoke. Double-needle stitched for added strength. 2? extended tail. Available in Large, XL, 2XL, 3XL, 4XL, 5XL & 6XL! 100% combed cotton pique with left chest pocket. Three horn buttons. Clean-finished placket and bottom hem with side vents. Half-moon yoke. 2? extended tail. Double-stitched for added strength. Available in Small, Medium, Large, XL, 2XL, 3XL, 4XL, 5XL & 6XL! 100% combed cotton pique with left chest pocket. Three horn buttons. Clean-finished placket and bottom hem with side vents. Half-moon yoke. 2? extended tail. Double-stitched for added strength. Available in Large, XL, 2XL, 3XL, 4XL, 5XL & 6XL! 60% cotton/40% polyester pique knit featuring the UltraCool™ system, developed to control and manage perspiration. Jacquard knit collar and cuffs. Clean-finished placket and hemmed bottom with side vents. Half-moon yoke. Three horn buttons. 2? extended tail. Double-stitched seams for added strength.Available in X-Small, Small, Medium, Large, XL, 2XL, 3XL, 4XL, 5XL & 6XL! 60% cotton/40% polyester pique knit featuring the UltraCool system, developed to control and manage perspiration. Jacquard knit collar and cuffs. Clean-finished placket and hemmed bottom with side vents. Half-moon yoke. Three horn buttons. 2? extended tail. Double-stitched seams for added strength.Available in Large, XL, 2XL, 3XL, 4XL, 5XL & 6XL! Fashion is the main Attraction in this adorable Premium Quality golf shirt for women . Constructed of 6.7 oz. 100% combed cotton jersey knit, in a fitted silhouette cut with a self-fabric collar and narrow 6-button placket. Accented with small capped sleeves and pearl buttonsAvailable in X-Small, Small, Medium, Large, XL, 2XL, 3XL & 4XL! Everyone?s favorite golf shirt ? with an updated look and fabric. Men?s 100% ring spun combed cotton baby pique. Three pearl buttons. Clean-finished placket and bottom hem with side vents. Half-moon yoke. Double-needle stitched for added strength. 2? extended tail. Available in Small, Medium, Large, XL, 2XL, 3XL & 4XL! Everyone?s favorite golf shirt ? with an updated look and fabric. Men?s 100% ring spun combed cotton baby pique. Three pearl buttons. Clean-finished placket and bottom hem with side vents. Half-moon yoke. Double-needle stitched for added strength. 2? extended tail. Available in Large, XL, 2XL, 3XL, 4XL, 5XL & 6XL! Everyone?s favorite pocketed golf shirt ? with an updated look and fabric. Men?s 100% ring spun combed cotton baby pique. Three pearl buttons. Clean-finished placket and bottom hem with side vents. Half-moon yoke. Double-needle stitched for added strength. 2? extended tail. Available in Small, Medium, Large, XL, 2XL, 3XL, 4XL, 5XL & 6XL! 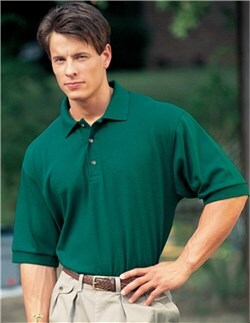 Everyone?s favorite pocketed golf shirt ? with an updated look and fabric. Men?s 7 oz. 100% ring spun combed cotton baby pique. Three pearl buttons. Clean-finished placket and bottom hem with side vents. Half-moon yoke. Double-needle stitched for added strength. 2? extended tail. Available in Large, XL, 2XL, 3XL, 4XL, 5XL & 6XL! Men?s 100% combed cotton pique knit. Jacquard knit collar and cuffs. Clean finished placket and hemmed bottom with side vents. Half-moon yoke. Four horn buttons. 2? extended tail. Double-stitched seams for added strength. Available in Small, Medium, Large, XL, 2XL, 3XL, 4XL, 5XL & 6XL! Men?s 100% combed cotton pique knit. Jacquard knit collar and cuffs. Clean finished placket and hemmed bottom with side vents. Half-moon yoke. Four horn buttons. 2? extended tail. Double-stitched seams for added strength. Available in Large, XL, 2XL, 3XL, 4XL, 5XL & 6XL! 100% combed cotton pique knit with pocket. Features a jacquard knit design on the collar and cuffs, clean finished placket, hemmed bottom with side vents, half-moon yoke, four horn buttons, and 2 extended tail for easy styling. The double-stitched seams provide added strength and durability. Available in X-Small, Small, Medium, Large, XL, 2XL, 3XL & 4XL! The Premium Quality Ladies Artisan Golf Shirt is the perfect women?s pique golf shirt combining the easy care of a 60% cotton/40% polyester blend with a fabric protector to resist stains. Features three horn buttons and a square hemmed bottom with side vents. Available in X-Small, Small, Medium, Large, XL, 2XL, 3XL & 4XL! The perfect men?s pique golf shirt, combining the easy care of a 7 60% cotton/40% polyester blend with a fabric protector to resist stains. Constructed with a clean finished placket and three horn buttons. Features a hemmed bottom with side vents and a half-moon yoke. 2? extended tail. Available in Small, Medium, Large, XL, 2XL, 3XL, 4XL, 5XL & 6XL! The perfect men?s pique golf shirt, combining the easy care of a 7 oz. 60% cotton/40% polyester blend with a fabric protector to resist stains. Constructed with a clean finished placket and three horn buttons. Features a hemmed bottom with side vents and a half-moon yoke. 2? extended tail. Available in Large, XL, 2XL, 3XL, 4XL, 5XL & 6XL! The perfect men?s pique golf shirt with pocket, combining the easy care of a 60% cotton/40% polyester blend with a fabric protector to resist stains. Constructed with a clean finished placket and three horn buttons. Features a hemmed bottom with side vents and a half-moon yoke. 2? extended tail. Available in Small, Medium, Large, XL, 2XL, 3XL, 4XL, 5XL & 6XL! The perfect men?s pique golf shirt with pocket, combining the easy care of a 60% cotton/40% polyester blend with a fabric protector to resist stains. Constructed with a clean finished placket and three horn buttons. Features a hemmed bottom with side vents and a half-moon yoke. 2? extended tail. Available in Large, XL, 2XL, 3XL, 4XL, 5XL & 6XL! 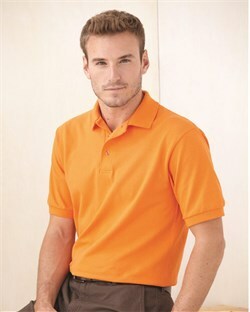 Men?s 60% cotton/40% polyester golf shirt with left chest pocket. Jacquard knit collar and cuffs with natural trim. Clean-finished placket and hemmed bottom with side vents. Half-moon yoke. Three horn buttons. 2? extended tail. Double-stitched seams for added strength. Available in Large, XL, 2XL, 3XL, 4XL, 5XL & 6XL! Cultivate an Aura of individuality in this Women?s 100% microfiber polyester Johnny collar golf shirt with basket pattern. Featuring the UltraCool™ system to control and manage perspiration. Accented with a tipped birdseye collar and cuffs. Square hemmed bottom with side vents.Available in X-Small, Small, Medium, Large, XL, 2XL, 3XL & 4XL! 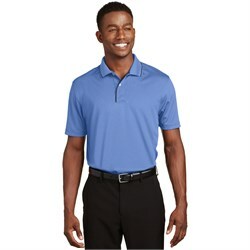 A 100% microfiber polyester golf shirt with basket pattern, featuring the UltraCool™ system to control and manage perspiration. It has a tipped birdseye collar and cuffs, three-button placket and hemmed bottom with side vents, half-moon yoke and 2? extended tail. Available in Small, Medium, Large, XL, 2XL, 3XL, 4XL, 5XL & 6XL! A 4.7 oz. 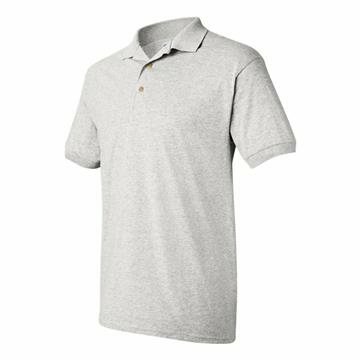 100% microfiber polyester golf shirt with basket pattern, featuring the UltraCool system to control and manage perspiration. It has a tipped birdseye collar and cuffs, three-button placket and hemmed bottom with side vents, half-moon yoke and 2? extended tail. Available in Large, XL, 2XL, 3XL, 4XL, 5XL & 6XL! Women?s 5.8 oz. 100% double-mercerized cotton premium quality arcadia baby pique golf shirt . Refined herringbone edging along collar and cuffs. One-button ?Y? neckline and half-moon yoke back. Brass inlay button and square bottom with side vents. Available in X-Small, Small, Medium, Large, XL, 2XL, 3XL & 4XL! Men?s 5.8 oz. 100% double mercerized cotton baby pique golf shirt. Refined herringbone edging along collar and cuffs. Three button placket and half-moon yoke back. Brass inlay buttons and square bottom with side vents. Available in Small, Medium, Large, XL, 2XL, 3XL, 4XL, 5XL & 6XL! Men?s 100% double mercerized cotton baby pique golf shirt. Refined herringbone edging along collar and cuffs. Three button placket and half-moon yoke back. Brass inlay buttons and square bottom with side vents. Available in Large, XL, 2XL, 3XL, 4XL, 5XL & 6XL! 100% double-mercerized cotton with micro-stripe design. Three-button placket and half-moon yoke back. Brass inlay buttons and square bottom with side vents. Available in Small, Medium, Large, XL, 2XL, 3XL & 4XL! 100% double-mercerized cotton with rib stripe jacquard body. Three-button placket and half-moon yoke back. Brass inlay buttons and square bottom with side vents. Available in Small, Medium, Large, XL, 2XL, 3XL & 4XL! 100% double-mercerized cotton with broad stripe jacquard body. Welt edge-striped trim collar and cuffs. Three-button placket and half-moon yoke back. Brass inlay buttons and square bottom with side vents. Available in Small, Medium, Large, XL, 2XL, 3XL & 4XL! Form meets function in the Aurora shirt for women.The Premium Quality 3/4-sleeve pique knit golf shirt is made from 60% cotton/40% polyester. Features a narrow three-button placket and square hemmed bottom. Pearl buttons and double-stitched seams at sleeves and hem. Available in X-Small, Small, Medium, Large, XL, 2XL, 3XL & 4XL! 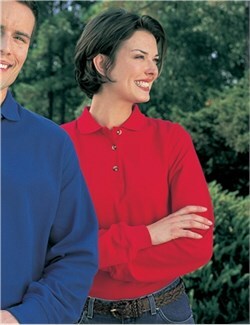 Women?s Premium Quality pique knit 60% cotton/40% polyester long sleeve Victory golf shirt . Constructed with a clean-finished placket with three horn buttons and square hemmed bottom. Features double-stitched seams for added strength and durability. Available in X-Small, Small, Medium, Large, XL, 2XL, 3XL & 4XL! Men?s 60% cotton/40% polyester pique knit long sleeve golf shirt. Constructed with a clean finished placket and square hemmed bottom. Features three horn buttons and double-stitched seams for added strength and durability. Available in Large, XL, 2XL, 3XL, 4XL, 5XL & 6XL! 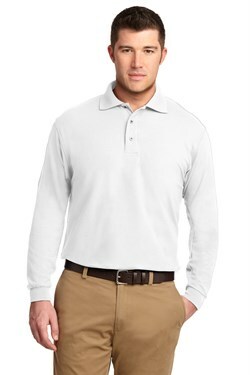 An 60% cotton/40% polyester pique knit long sleeve golf shirt with left chest pocket. Constructed with a clean-finished placket and square hemmed bottom. Features three horn buttons and double stitched seams for added strength and great durability. Available in Large, XL, 2XL, 3XL, 4XL, 5XL & 6XL! The Premium Quality Ladies Long Sleeve Eclipse Sport Shirt is real style that doesn?t have to Eclipse comfort, thanks to this Women?s 100% polyester pique long sleeve golf shirt featuring the UltraCool system to control and manage perspiration. Constructed with one-button ?Y? neckline, mesh side panels, and ribbed cuffs. Square bottom with side vents. Available in X-Small, Small, Medium, Large, XL, 2XL, 3XL & 4XL! Take cool comfort to the next level with Escalate, the Men?s 100% polyester pique long sleeve golf shirt featuring the UltraCool™ system to control and manage perspiration. Constructed with a three-button placket, mesh side panels, and ribbed cuffs. Half-moon yoke back and square bottom with side vents. Available in Small, Medium, Large, XL, 2XL, 3XL & 4XL! Take cool comfort to the next level with Escalate, the Men?s 100% polyester pique long sleeve golf shirt featuring the UltraCool system to control and manage perspiration. Constructed with a three-button placket, mesh side panels, and ribbed cuffs. Half-moon yoke back and square bottom with side vents. Available in Large, XL, 2XL, 3XL, 4XL, 5XL & 6XL! 100% combed cotton pique knit long sleeve golf shirt. Constructed with a clean-finished placket and three horn buttons. Features rib knit cuffs, a square hemmed bottom with side vents and a half-moon yoke. Available in Small, Medium, Large, XL, 2XL, 3XL, 4XL & 5XL! 100% combed cotton pique knit long sleeve golf shirt. Constructed with a clean-finished placket and three horn buttons. Features rib knit cuffs, a square hemmed bottom with side vents and a half-moon yoke. Available in Large, XL, 2XL, 3XL, 4XL, 5XL & 6XL! 100% polyester waffle knit golf shirt features Tri-Mountain UltraCool™ moisture wicking technology that helps you keep moving forward, regardless of the temperature. Accented with contrast underarm panels, collar and half-cuff trim for a sporty look. Three-button placket, half-moon yoke back and square bottom with side vents. 100% polyester waffle knit golf shirt features Tri-Mountain UltraCool moisture wicking technology that helps you keep moving forward, regardless of the temperature. Accented with contrast underarm panels, collar and half-cuff trim for a sporty look. Three-button placket, half-moon yoke back and square bottom with side vents. 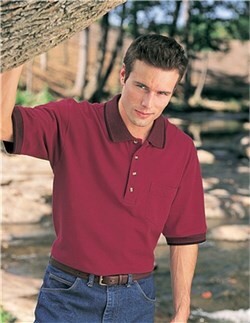 Men?s 60% cotton/40% polyester golf shirt with left chest pocket. Jacquard knit collar and cuffs with natural trim. Clean-finished placket and hemmed bottom with side vents. Half-moon yoke. Three horn buttons. 2? extended tail. Double-stitched seams for added strength. Available in X-Small, Small, Medium, Large, XL, 2XL, 3XL, 4XL, 5XL & 6XL! Men?s 60% cotton/40% polyester pique knit long sleeve golf shirt. Constructed with a clean finished placket and square hemmed bottom. Features three horn buttons and double-stitched seams for added strength and durability. Available in X-Small, Small, Medium, Large, XL, 2XL, 3XL & 4XL! 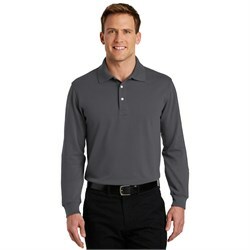 An 60% cotton/40% polyester pique knit long sleeve golf shirt with left chest pocket. Constructed with a clean-finished placket and square hemmed bottom. Features three horn buttons and double stitched seams for added strength and great durability. Available in X-Small, Small, Medium, Large, XL, 2XL, 3XL & 4XL! 100% polyester textured jacquard golf shirt. Features UltraCool™ moisture wicking technology. Side and underarm panels provide a sporty look. Three-button placket and half-moon yoke back. Brass inlay buttons and square bottom with side vents. Make a strong first (and 20th) impression. Proven in independent lab tests to maintain its appearance up to 20 washes, the EZCotton Pique Sport Shirt has an anti-curl collar and resists pilling, fading, wrinkling and shrinking with ease. Crafted from super soft 100% long-staple cotton, the EZCotton Pique Sport Shirt has a professional appearance that simply wont wash away. ?100% cotton ?Double-needle stitching?Piping detail inside neckband ?Flat knit collar ?3-button placket ?Open hem sleeves ?Side vents Available in X-Small, Small, Medium, Large, XL, 2XL, 3XL, 4XL, 5XL & 6XL! Wear our stylish polo to the office, pack it for the weekend, take it everywhere you go. 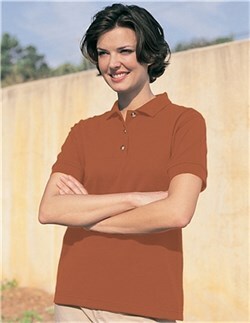 Short sleeve womens fitted mini pique polo. Rib collar and sleeve cuffs with slim 4 button placket styling.97/3 Cotton/Spandex.Rib collar and cuffs.Four tonal buttons on a slim placket. 51% cotton/49% polyester vertical striped jacquard golf shirt featuring Tri-Mountain UltraCool™ moisture wicking technology. Tonal piping along side panels and sleeves. Three-button placket and half-moon yoke back. Brass inlay buttons and square bottom with side vents. Open cuffs. This polo steers clear of the ordinary with a dynamic horizontal texture and cross-grain panels on the shoulders, inner placket and sleeves. ?100% polyester with stay-cool wicking technology ?OGIO heat transfer label for tag free comfort ?OGIO jacquard neck tape ?2-snap square placket with debossed logo metal snaps ?OGIO badge on left sleeve ?Side vents with logo metal rivet Available in Small, Medium, Large, XL, 2XL, 3XL & 4XL! Strategically placed rivets, a jeans-inspired placket and an extra smooth hand give this polo the right balance between edgy and classic. ?100% polyester interlock with stay-cool wicking technology ?Triple-needle stitching throughout ?OGIO heat transfer label for tag free comfort ?Self-fabric collar ?3-button placket with OGIO engraved metal buttons with clear plastic rims ?OGIO badge on left sleeveAvailable in Small, Medium, Large, XL, 2XL, 3XL & 4XL! 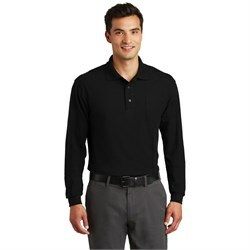 Ogio Mens Polo Shirt Caliber Golf Sport ShirtThis Ogio Mens Polo Shirt Caliber Golf Sport Shirt accelerates beyond the limits when it comes to a high performance polo shirt complementing your favorite jeans with its round bartracked placket! 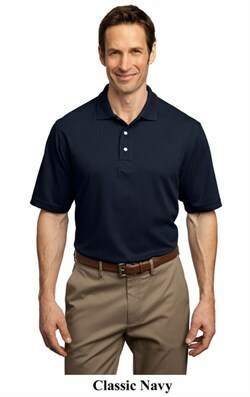 Our 100% polyester polo with stay-cool wicking technology, jacquard neck tape, rib knit, collar and cuffs, triple-needle shoulders and hem, 3 button placket with dyed to match buttons and ?Ogio? badge on left sleeve is second to none making a perfect choice for every man!Available in X-Small, Small, Medium, Large, XL, 2XL, 3XL & 4XL! Ogio Ladies Polo Shirt Jewel Golf Sport ShirtThis Ogio Ladies Polo Shirt Jewel Golf Sport Shirt makes quite the choice per its impeccable design! Our 100% polyester Golf Shirt with stay-cool wicking technology, OGIO jacquard neck tape, Self-fabric collar, Rib knit cuffs, OGIO heat transfer label for tag free comfort, 6-button placket with OGIO dyed-to-match buttons and OGIO badge on left sleeve is a treasure! The Jewel has a contoured fit and streamlined style which elegantly captures this casual classic making an impressive choice or gift for everyone woman!Available in Ladies X-Small, Ladies Small, Ladies Medium, Ladies Large, Ladies XL, Ladies 2XL, Ladies Plus 1X & Ladies Plus 2X! Gear up for adventure in this polo energized with rib knit panels under the arms and an angled zippered pocket on the right chest. ?100% polyester with stay-cool wicking technology ?Triple-needle stitching throughout ?OGIO heat transfer label for tag free comfort ?Self-fabric collar ?OGIO jacquard neck tape ?Raised OGIO inner placket webbing tape ?3-snap square placket with debossed logo metal snaps ?OGIO badge on left sleeve Available in X-Small, Small, Medium, Large, XL, 2XL, 3XL & 4XL! 100% preshrunk ringspun cotton tubular sport shirt. Welt collar. Double-needle stitched hemmed bottom. men.Welt cuffs. 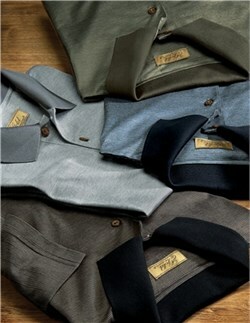 Two-button clean-finished placket with wood-tone buttonsAvailable in Small, Medium, Large, XL & 2XL! 100% combed cotton pique sport shirt. Welt fashion collar and cuffs. Two button clean-finished placket with edge stitching, back stitching and reinforced box.Pearlized buttons. Taped neck and single-needle top-stitched armholes. 2 single-needle side vents and extended tail.Available in Small, Medium, Large, XL, 2XL & 3XL! 100% combed cotton 5.5 ounce. Double-needle hemmed bottom with side vents. Engineered stripes.Half moon patch on back. PGA Tour swinging man tonal logo on right sleeve. Reinforced shoulder seams. Ribbed collar and cuffs. Taped neckline.Three-button placket with PGA Tour embossed smoked buttons. The diameter of thread and thread-count used to create a fabric is a huge factor in how a garment will look and feel. This Fine Knit Pima Cotton Sport Shirt has been created using 40-doubles, a high yarn count in which 2-ply yarn has been used for a finer feel. This, added to the high quality of Pima Cotton, creates a garment that is supremely light, soft and elegant.Fabric/Style: 100% Pima Cotton; Double-needle stitching at armholes, shoulder and hem. Smoked pearl buttons. Shaped feminine fit with a narrow 5-button placket and self-fabric collar. A great gift for any Stooges lover!100% cotton knit polo shirtAvailable in Small, Medium, Large, XL, 2XL, 3XL & 4XL! 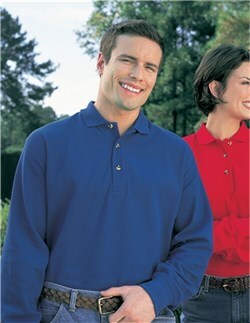 100% cotton two-color ribbed knit sport shirt with taped welt collar and cuffs. embroidered izod logo on lower right sleeve. two-button placket, pearlized buttons embossed IZOD.Double-needle stitched hemmed bottom with side vents and dropped tailAvailable in Small, Medium, Large, XL & 2XL! Our renowned pique knit sport shirt is soft, casual and a tried-and-true customer favorite. With an abundance of colors, this shrink-resistant sport shirt is easy to care for and just gets better looking over repeated washing and wear. Quite simply, youd be hard pressed to find a better pique knit sport shirt that meets our impeccable standards.Heavyweight pique. Preshrunk 100% ring spun combed cotton.Available in X-Small, Small, Medium, Large, XL, 2XL, 3XL, 4XL, 5XL & 6XL! Our renowned pique knit sport shirt is soft, casual and a tried-and-true customer favorite. With an abundance of colors, this shrink-resistant sport shirt is easy to care for and just gets better looking over repeated washing and wear. Quite simply, youd be hard pressed to find a better pique knit sport shirt that meets our impeccable standards.100% ring spun combed cotton. Garment washed to enhance softness. Double-needle stitching.Available in X-Small, Small, Medium, Large, XL, 2XL, 3XL, 4XL, 5XL & 6XL! This soft, garment washed sport shirt makes whatever comes your way a breeze. The breathable mesh weave helps keep you cool while the cotton knit assures you look it.100% ring spun combed cotton. Double-needle stitching.Flat knit collar and cuffs. 3-button placket with horn-tone buttons.Available in X-Small, Small, Medium, Large, XL, 2XL, 3XL, 4XL, 5XL & 6XL! Comfy and soft, this sport shirt has a special mesh knit for breathability. Easy to care for, this shirt retains its neat, crisp look day after day.60/40 cotton/poly mesh knit. Flat knit collar. 3-button placket.Double-needle sleeves and hem. Contrast underplacket.Available in X-Small, Small, Medium, Large, XL, 2XL, 3XL, 4XL, 5XL & 6XL! Few can resist the delightfully soft hand and lightweight honeycomb knit texture of our 100% Pima cotton sport shirt. Crafted with 100% Supima® Pima cotton-one of the highest grades of cotton in the world-this sumptuous shirt is consistently a top seller! Available in 14 colors, youre sure to find just the right one for your needs.100% extra-long staple Supima Pima cotton. Double-needle stitching. Flat knit collar and cuffs.Available in X-Small, Small, Medium, Large, XL, 2XL, 3XL, 4XL, 5XL & 6XL! A top performer when you need to stay cool and confident! Soft and breathable, this baby pique sport shirt has our exclusive Rapid Dry moisture wicking technology. The unique knit wicks moisture away from the body to the shirts surface where it quickly disperses and evaporates.60/40 cotton/poly. Double-needle stitching. 3-button placket.Available in X-Small, Small, Medium, Large, XL, 2XL, 3XL, 4XL, 5XL & 6XL! Our Dri-Mesh double mesh cooling technology combines with a tipped collar and piping for a comfy sport shirt that not only performs...but looks great too!100% polyester double mesh. Taped neck. Striped placket and collar.2-button placket with pearlized buttons. Double-needle stitching on shoulders and hem.Available in X-Small, Small, Medium, Large, XL, 2XL, 3XL & 4XL! Take the sweat out of working at high speeds or humidity. Advanced double poly mesh has all the advantages of lightweight moisture wicking and breathability in a classic style thats full of confidence.100% poly double mesh. Double-needle stitching on armholes, shoulders and hem.Available in Small, Medium, Large, XL, 2XL, 3XL & 4XL! A tried-and-true customer favorite, our comfortable classic sport shirt is anything but ordinary. With a silky smooth hand and easy care blend, its a first-rate choice for uniforming just about any group.65/35 poly/cotton. Flat knit collar and cuffs.Available in X-Small, Small, Medium, Large, XL, 2XL, 3XL, 4XL, 5XL & 6XL! The stripe trim on the collar and cuff adds a distinctive touch to our soft, supple pique thats easy care, wrinkle resistant and shrink resistant.65/35 poly/cotton pique. Flat knit collar and cuffs.Available in X-Small, Small, Medium, Large, XL, 2XL, 3XL & 4XL! Our renowned pique knit sport shirt is soft, casual and a tried-and-true customer favorite. With an abundance of colors, this shrink-resistant sport shirt is easy to care for and just gets better looking over repeated washing and wear. Quite simply, youd be hard pressed to find a better pique knit sport shirt that meets our impeccable standards.Heavyweight pique. Preshrunk 100% ring spun combed cotton. Few can resist the delightfully soft hand and lightweight honeycomb knit texture of our 100% Pima cotton sport shirt. Crafted with 100% Supima® Pima cotton-one of the highest grades of cotton in the world-this sumptuous shirt is consistently a top seller! Available in 14 colors, youre sure to find just the right one for your needs.100% extra-long staple Supima Pima cotton. Double-needle stitching. Traditional, relaxed look. 2-button Y-placket. A top performer when you need to stay cool and confident! Soft and breathable, this baby pique sport shirt has our exclusive Rapid Dry moisture wicking technology. The unique knit wicks moisture away from the body to the shirts surface where it quickly disperses and evaporates.60/40 cotton/poly. Double-needle stitching. Traditional, relaxed look. V-neck with crossover rib knit trim. A tried-and-true customer favorite, our comfortable classic sport shirt is anything but ordinary. With a silky smooth hand and easy care blend, its a first-rate choice for uniforming just about any group.65/35 poly/cotton pique. Knit collar and cuffs. Double-needle armholes and bottom hem . Heavy 50/50 cotton/poly jersey with stain repel & release. Soft fashion knit contoured collar and welt sleeve bands.Three pearlized buttons. Side seamed with 2 side ventsAvailable in Ladies Small, Ladies Medium, Ladies Large, Ladies XL & Ladies 2XL! 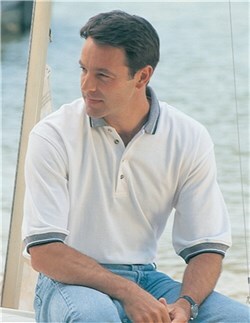 An instant classic, this shirt offers a soft, comfortable look for easygoing style.100% ring spun combed cotton pique. Rib knit collar and cuffs.2-button placket.Available in X-Small, Small, Medium, Large, XL, 2XL, 3XL & 4XL! Our modern polo silhouette with a feminine fit.94/6 cotton/spandex. Rib knit collar and cuffs. 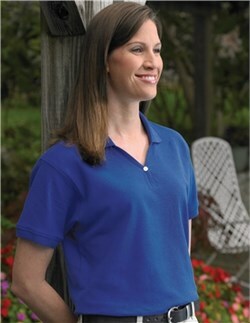 Made from a stretchy cotton blend, this fitted polo has true feminine appeal.94/6 cotton/spandex.Rib knit collar. Heavyweight pique offers durability and long-term wear. Garment washed for a soft feel and reduced shrinkage. Full cut for easy movement and a relaxed fit.100% ring spun combed cotton pique. Double-needle stitching. Welt collar.Pewter-tone buttons.Available in X-Small, Small, Medium, Large, XL, 2XL, 3XL, 4XL, 5XL & 6XL! Contrasting color enhances the appearance of this crisp, classic sport shirt. Cut from yarn-dyed fabric for rich color throughout.60/40 cotton/poly. Double-needle stitching. Flat knit collar and cuffs with contrast stripe trim.Available in X-Small, Small, Medium, Large, XL, 2XL, 3XL & 4XL! 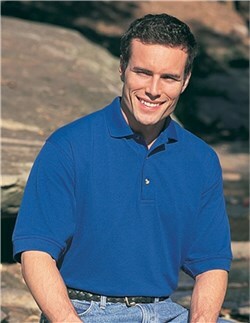 With genuine quality knit into every yarn-dyed fiber, this sport shirt has the classic appeal of a fine knit jacquard. Pairs wonderfully with a sport coat, khakis or jeans.65/35 cotton/poly. Jacquard collar and cuffs.Contrast placket lining.Available in X-Small, Small, Medium, Large, XL, 2XL, 3XL & 4XL! You cant beat the unique look and character of pigment-dye for lived-in appeal. Until now. Made with a proprietary process, our new Weather Worn Sport Shirt is our softest pigment-dyed* shirt ever! It has the unbeatable look of pigment-dye but, like your favorite jeans, its been broken in for incredible softness. The mellow attitude just gets better with every trip through the washer and dryer.100% cotton.Available in X-Small, Small, Medium, Large, XL, 2XL, 3XL & 4XL! 100% ring spun combed cotton.Cool Mesh knit has superior breathability.Garment washed to enhance softness.Double-needle stitching. 3-button placket. Horn-tone buttons.Available in X-Small, Small, Medium, Large, XL, 2XL, 3XL & 4XL! Crisp enough for corporate wear with enough personality to stay casual. This Ottoman knit is becoming any way you wear it and anywhere you take it.82/18 poly/rayon. Flat knit collar with jacquard trim detail.Available in X-Small, Small, Medium, Large, XL, 2XL, 3XL, 4XL, 5XL & 6XL! The high quality of long-staple Supima® Pima cotton makes it ideal for fine knit, luxurious fabrics. Crafting this elegant garment from 2-ply yarn gives it a noticeably softer feel and longer-lasting good looks.100% Supima® Pima cotton. Flat knit collar. 3-button placket.Double-needle stitching at armholes, shoulder and hem.Available in X-Small, Small, Medium, Large, XL, 2XL, 3XL, 4XL, 5XL & 6XL! A top performer when you need to stay cool and comfortable! Now available with long sleeves, this soft, breathable baby pique sport shirt has our exclusive Rapid Dry moisture management technology. The unique knit wicks moisture away from the body to the shirts surface where it quickly disperses and evaporates.60/40 cotton/poly. Double-needle stitching.Available in X-Small, Small, Medium, Large, XL, 2XL, 3XL & 4XL! The contrast trim on the collar gives this baby pique sport shirt a sophisticated look while Rapid Dry technology expertly manages moisture. The result? You look great and feel great too.60/40 cotton/poly. Double-needle stitching.3-button placket with contrast color.Available in X-Small, Small, Medium, Large, XL, 2XL, 3XL & 4XL! The superb feel of interlock knit is striking on its own. Add in the subtle glow of jacquard knit shadow stripes and you have one of our most intriguing styles to date. A classic in fit and construction, this shirt takes a break from the ordinary with dashing, modern design.58/42 cotton/poly interlock is easy care.3-button placket with pearlized buttons.Available in X-Small, Small, Medium, Large, XL, 2XL, 3XL & 4XL! Moisture-wicking PimaCool™ technology gives you the comfort and coolness you crave. Light, airy and perfect for travel, our Pima Select Sport Shirt has a yarn-dyed trim accent for eye-catching distinction.55/45 Pima cotton/poly. Double-needle stitching.Mesh-backed fabric for breathability. Flat knit collar with yarn-dyed stripes.Available in X-Small, Small, Medium, Large, XL, 2XL, 3XL & 4XL! Our jacquard sport shirt is the perfect marriage of good looks and Dry Zone performance. 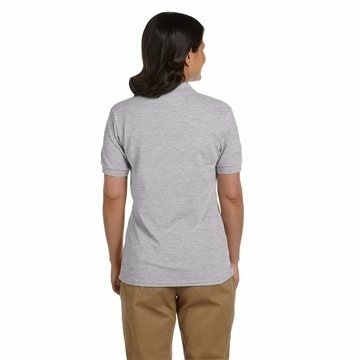 Lightweight and breathable, this shirt expertly wicks moisture for a cooling confidence that lasts all day long.100% polyester double knit. Flat knit collar. 3-button placket with tonal buttons.Available in X-Small, Small, Medium, Large, XL, 2XL, 3XL & 4XL! Our jacquard sport shirt is the perfect marriage of good looks and Dry Zone performance. Lightweight and breathable, this shirt expertly wicks moisture for a cooling confidence that lasts all day long.100% polyester double knit. Flat knit collar with tipping stripe. 3-button placket with tonal buttons.Available in X-Small, Small, Medium, Large, XL, 2XL, 3XL & 4XL! Experience a natural difference in our new 100% organic cotton sport shirt. Crafted from certified organic cotton, this sport shirt is soft, comfortable and gentle on the environment. Unlike standard cotton, our certified organic cotton has been grown without harsh chemicals for an uncompromising distinction you can feel. Casual corporate wear never looked-or felt-so good!100% certified organic cotton. Flat knit collar and cuffs.Available in X-Small, Small, Medium, Large, XL, 2XL, 3XL & 4XL! Our new Bamboo Blend Pique Sport Shirt is made from fabric originating from bamboo for exceptional breathability and comfort. With an earth-conscious bamboo blend, this sport shirt is also antimicrobial, UV-resistant and odor inhibiting. Beyond that, is also helps regulate body temperature and wicks moisture so you stay dry and confident all day long.68/32 poly/poly from bamboo charcoal. UPF rating of 50.Available in X-Small, Small, Medium, Large, XL, 2XL, 3XL & 4XL! A tried-and-true customer favorite, our comfortable classic sport shirt is anything but ordinary. With a silky smooth hand and easy care blend, its a first-rate choice for uniforming just about any group.65/35 poly/cotton pique.Double-needle armholes and bottom hem.Available in 7XL, 8XL, 9XL, 10XL! 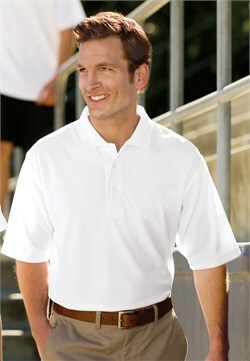 A customer favorite for years, the Silk Touch sport shirt is soft, supple and easy to care for. The silky smooth pique knit resists wrinkles while the classic long sleeve style looks great on everyone.65/35 poly/cotton pique. Flat knit collar and cuffs.Available in X-Small, Small, Medium, Large, XL, 2XL, 3XL, 4XL, 5XL & 6XL! 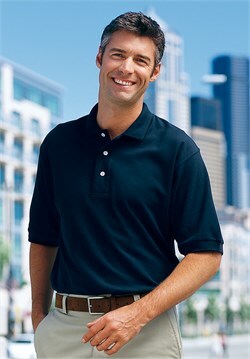 A customer favorite for years, the Silk Touch sport shirt is soft, supple and easy to care for. The silky smooth pique knit resists wrinkles while the classic long sleeve style looks great on everyone.65/35 poly/cotton pique.Double-needle armholes and hem. 3-button placket.Metal buttons with dyed-to-match plastic rims.Available in X-Small, Small, Medium, Large, XL, 2XL, 3XL & 4XL! This new sport shirt! With its unique colorblocking detail on the left chest, you simply cant overlook the retro appeal of this shirt.65/35 poly/cotton pique. Double-needle stitching.2-button contrast placket. Metal buttons with dyed-to-match rims.Available in X-Small, Small, Medium, Large, XL, 2XL, 3XL & 4XL! With true classic style, our lightweight Ottoman Sport Shirt will keep you looking great at any corporate event. Our exclusive Dry Zone moisture wicking technology takes moisture away from your skin-and off your mind.100% polyester. Flat knit collar.2-button placket with dyed-to-match buttons. Raglan sleeves for ease of movement. Shrink resistant.Available in X-Small, Small, Medium, Large, XL, 2XL, 3XL, 4XL, 5XL & 6XL! 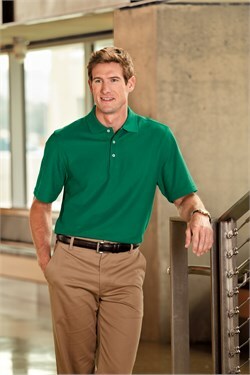 This sport shirt upholds the exceptional quality and value youve come to trust from Port & Company.100% colorfast cotton. **ASH - 99/1 Cotton/Poly. Welt collar and hemmed sleeves.2-button placket. Double-needle sleeve and hem.Available in Small, Medium, Large, XL, 2XL, 3XL & 4XL! 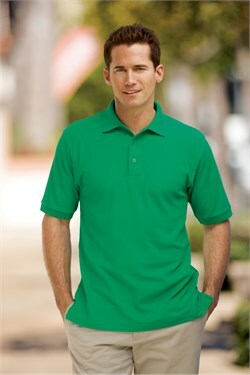 Made from our comfortable Pima-Tek fabric, this polo offers the best in softness and performance. The long-staple Pima cotton lends a soft hand, while moisture is transferred to the outer layer for quick evaporation. Plus, the contrast piping adds a stylish accent.60% super-soft Pima cotton blended with 35% micro-polyester, 5% spandex jersey knit. Gently contoured silhouette. Tagless label. For total comfort, we combined superior moisture-wicking Pima-Tek technology with the luxurious softness of long-staple Pima cotton. The advanced design helps keep you dry by transferring perspiration to the outer layer where it quickly evaporates.60% super-soft Pima cotton blended with 35% micro-polyester, 5% spandex jersey knit.Traditional, relaxed look. Tagless label. You cant beat the unique look and character of pigment-dye for lived-in appeal. Until now. Made with a proprietary process, our new Weather Worn Sport Shirt is our softest pigment-dyed* shirt ever! It has the unbeatable look of pigment-dye but, like your favorite jeans, its been broken in for incredible softness. The mellow attitude just gets better with every trip through the washer and dryer.100% cotton. Gently contoured silhouette. Self-fabric collar. 5-button placket. This soft, garment washed sport shirt makes whatever comes your way a breeze. The breathable mesh weave helps keep you cool while the cotton knit assures you look it.100% ring spun combed cotton. Double-needle stitching.Flat knit collar and cuffs. V-neck style Johnny collar. Comfy and soft, this sport shirt has a special mesh knit for breathability. 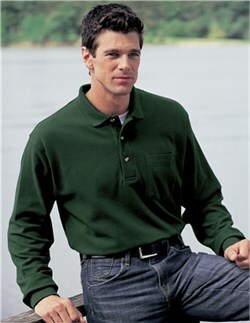 Easy to care for, this shirt retains its neat, crisp look day after day.60/40 cotton/poly mesh knit. Traditional, relaxed look.Double-needle sleeves and hem. Contrast underplacket. A top performer when you need to stay cool and confident! Soft and breathable, this baby pique sport shirt has our exclusive Rapid Dry moisture wicking technology. The unique knit wicks moisture away from the body to the shirts surface where it quickly disperses and evaporates.60/40 cotton/poly. Double-needle stitching. Self-fabric collar.Full button placket with pearlized buttons. Hemmed short sleeves. The contrast trim on the collar gives this baby pique sport shirt a sophisticated look while Rapid Dry technology expertly manages moisture. The result? You look great and feel great too.60/40 cotton/poly. Double-needle stitching. Gently contoured silhouette.4-button placket with contrast color. The superb feel of interlock knit is striking on its own. Add in the subtle glow of jacquard knit shadow stripes and you have one of our most intriguing styles to date. A classic in fit and construction, this shirt takes a break from the ordinary with dashing, modern design.58/42 cotton/poly interlock is easy care. Traditional, relaxed look. 3-button placket with pearlized buttons. Our Dri-Mesh double mesh cooling technology combines with a tipped collar and piping for a comfy sport shirt that not only performs...but looks great too!100% polyester double mesh. Gently contoured silhouette.Striped placket and collar. 3-button placket with pearlized buttons. Take the sweat out of working at high speeds or humidity. Advanced double poly mesh has all the advantages of lightweight moisture wicking and breathability in a classic style thats full of confidence.100% poly double mesh. Double-needle stitching on armholes, shoulders and hem.Gently contoured silhouette. Self-fabric Johnny collar. A favorite for travelers, this luxurious sport shirt keeps you cool and comfortable with moisture-wicking PimaCool technology. Especially good for warmer climates and summer wear, this sport shirt is easy to care for and feels great against your skin.55/45 cotton/poly. Double-needle stitching. Traditional, relaxed look.Self-fabric collar. Slim 4-button placket with grosgrain trim. Mesh-backed fabric for breathability. Crafted from luxurious Pima cotton and infused with earth-friendly modal, this Soft Touch top adds a silky smooth layer to any outfit. With a greater softness than any other cotton blend, modal reduces pilling, shrinkage and fading while lending a gentle hand and drape.60/40 Pima cotton/modal. Gently contoured silhouette.Split placket with satin trim. Our jacquard sport shirt is the perfect marriage of good looks and Dry Zone performance. Lightweight and breathable, this shirt expertly wicks moisture for a cooling confidence that lasts all day long.100% polyester double knit. Gently contoured silhouette.Flat knit collar. 4-button placket with tonal buttons. Our jacquard sport shirt is the perfect marriage of good looks and Dry Zone performance. 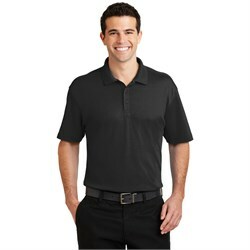 Lightweight and breathable, this shirt expertly wicks moisture for a cooling confidence that lasts all day long.100% polyester double knit. Gently contoured silhouette.Self-fabric collar. Full button closure with tonal buttons. Experience a natural difference in our new 100% organic cotton sport shirt. Crafted from certified organic cotton, this sport shirt is soft, comfortable and gentle on the environment. Unlike standard cotton, our certified organic cotton has been grown without harsh chemicals for an uncompromising distinction you can feel. Casual corporate wear never looked-or felt-so good!100% certified organic cotton. Traditional, relaxed look. Our new Bamboo Blend Pique Sport Shirt is made from fabric originating from bamboo for exceptional breathability and comfort. With an earth-conscious bamboo blend, this sport shirt is also antimicrobial, UV-resistant and odor inhibiting. Beyond that, is also helps regulate body temperature and wicks moisture so you stay dry and confident all day long.68/32 poly/poly from bamboo charcoal. UPF rating of 50. 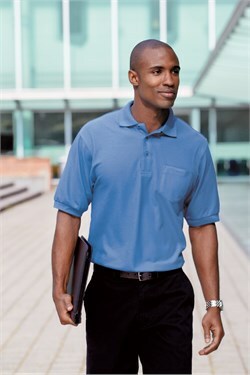 A customer favorite for years, the Silk Touch sport shirt is soft, supple and easy to care for. The silky smooth pique knit resists wrinkles while the classic long sleeve style looks great on everyone.65/35 poly/cotton pique. Traditional, relaxed look.Flat knit collar and cuffs. Double-needle armholes and hem. Reverse placket. With true classic style, our lightweight Ottoman Sport Shirt will keep you looking great at any corporate event. Our exclusive Dry Zone moisture wicking technology takes moisture away from your skin-and off your mind.100% polyester. Traditional, relaxed look.4-button placket with dyed-to-match buttons. Shrink resistant. Soft, supple and easy to care for, our new Silk Touch Sleeveless Sport Shirt is made from a silky smooth pique knit that resists wrinkles and looks flattering on everyone.65/35 poly/cotton pique. Traditional, relaxed look. Flat knit collar and cuffs.4-button reverse placket. Metal buttons with dyed-to-match plastic rims. 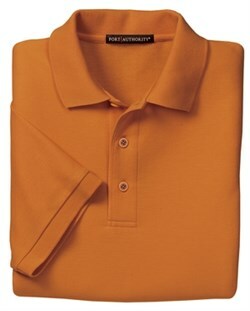 Made from our comfortable Pima-Tek fabric, this polo offers the best in softness and performance. The long-staple Pima cotton lends a soft hand, while moisture is transferred to the outer layer for quick evaporation. Plus, the contrast piping adds a stylish accent.60% super-soft Pima cotton blended with 35% micro-polyester, 5% spandex jersey knit.Classy shoulder piping and matching self-fabric collar.Tagless label.Available in X-Small, Small, Medium, Large, XL, 2XL, 3XL & 4XL! 50/50 cotton/poly.Welt collar and rib cuffs.2-button placket. Available in Small, Medium, Large, XL, 2XL & 3XL! 100% combed ring-spun pique cotton. Welt collar and cuffs.Available in Small, Medium, Large, XL, 2XL, 3XL & 4XL! 100% cotton. Welt collar and cuffs.3-button placket, clean finished with reinforced bottom box. **ASH-99/1 Cotton/Poly**Available in Small, Medium, Large, XL & 2XL! 100% ring spun cotton.Welt collar and cuffs with birdseye jacquard detailing 3-button placket, clean finished with reinforced bottom box.Wood-tone buttons. Double-needle hem.Available in Small, Medium, Large, XL & 2XL! 100% ring spun cotton. Roomier cut for comfort.Welt collar and cuffs. 3-button placket, clean finished with reinforced bottom box. **ASH-99/1 Cotton/Poly** **Sport Grey-90/10 Cotton/Poly**Available in Small, Medium, Large, XL & 2XL! 50/50 cotton/poly with SpotShield stain resistance.Five-point pocket on left chest.2-button placket.Seamless body with double-needle sleeves and hem.Available in Small, Medium, Large, XL, 2XL & 3XL! 100% ring spun cotton for comfort. Welt knit collar and sleeve bands. 2-button placket.Wood-tone buttons. Seamless body with double-needle hem. **Birch-99/1 Cotton/Poly**Available in Small, Medium, Large, XL, 2XL & 3XL! 100% combed ring spun cotton pique. Welt collar and cuffs.Top stitched shoulder and armhole seams. 2-button placket with wood-tone buttons.Side-seamed with side vents. Extended tail.Available in Small, Medium, Large, XL, 2XL, 3XL, 4XL, 5XL & 6XL! 100% ring spun combed cotton. Birdseye stripe collar and cuffs. Top-stitched shoulder and armhole seams.Side-seamed with side vents. Extended tail.Available in Small, Medium, Large, XL, 2XL & 3XL! 100% Egyptian cotton. Flat knit no-curl collar.Twill tape in neck and side vents. White pearlized buttons.3-button placket. Natural color locker patch. Available in Small, Medium, Large, XL, 2XL, 3XL, 4XL & 5XL! 100% Egyptian cotton. Flat knit no-curl collar.Twill tape in neck and side vents. White pearlized buttons. Shell pink locker patch. 100% Egyptian cotton diamond knit. Intarsia-tipped collar.Pearlized buttons. Contrast placket.Intarsia-tipped cuffs.Available in Small, Medium, Large, XL, 2XL & 3XL! 100% Egyptian cotton diamond knit.Intarsia-tipped collar.Split placket for feminine flair. 100% combed ring-spun cotton pique. Low shrinkage, fade resistant. No curl collar. Clean finished placket with three pearl buttons.Dyed-to-match neck and side-vent twill tape. Top-stitched shoulders, arms and cuffs. Ideal for uniforms.Available in Small, Medium, Large, XL, 2XL, 3XL, 4XL & 5XL! 100% combed ring-spun cotton pique. Low shrinkage, fade resistant. No curl collar.Side-seamed for a feminine fit. Clean finished placket with 4 pearl buttons.Dyed-to-match neck and side-vent twill tape. Ideal for uniforms. For total comfort, we combined superior moisture-wicking Pima-Tek technology with the luxurious softness of long-staple Pima cotton. The advanced design helps keep you dry by transferring perspiration to the outer layer where it quickly evaporates.60% super-soft Pima cotton blended with 35% micro-polyester, 5% spandex jersey knit. Tagless label.Available in X-Small, Small, Medium, Large, XL, 2XL, 3XL & 4XL! Strategically placed ventilation panels take the ultra-dry technology of Dri-Mesh to the pro level. This advanced mesh design truly performs by removing a major obstacle to comfort-sticky perspiration. Stretch-enhanced gussets boost the overall mobility and breathability of this hi-tech shirt.95/5 poly/spandex stretch mesh panels and locker patch.Available in X-Small, Small, Medium, Large, XL, 2XL, 3XL & 4XL! Our renowned pique knit sport shirt is soft, casual and a tried-and-true customer favorite. With an abundance of colors, this shrink-resistant sport shirt is easy to care for and just gets better looking over repeated washing and wear. Quite simply, youd be hard pressed to find a better pique knit sport shirt that meets our impeccable standards.Heavyweight pique. Preshrunk 100% ring spun combed cotton.Available in Large, XL, 2XL, 3XL & 4XL! A tried-and-true customer favorite, our comfortable classic sport shirt is anything but ordinary. With a silky smooth hand and easy care blend, its a first-rate choice for uniforming just about any group.65/35 poly/cotton pique. Knit collar and cuffs.Double-needle armholes and bottom hem. Metal buttons with dyed-to-match rims.Available in Large, XL, 2XL, 3XL & 4XL! Let the temperature rise. You’ll stay cool and confident in our new bamboo charcoal sport shirt. 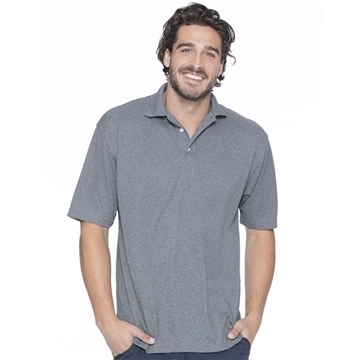 With exceptional breathability and softness, this shirt is knit with bamboo charcoal to help regulate body temperature, wick moisture, fight bacteria and inhibit odor. It also resists UV rays to help keep you protected and comfortable.53/47 poly/poly from bamboo charcoal. Double-needle stitching. 3-button placket with tonal piping.Available in X-Small, Small, Medium, Large, XL, 2XL, 3XL & 4XL! An eye-catching horizontal texture, a self-jacquard background and outstanding Dry Zone wicking performance make this new sport shirt a break from the norm. Lightweight with a fluid drape, it’s a relaxed—yet professional—addition to any wardrobe. Solid jersey insets show meticulous attention to detail.100% polyester. Double-needle stitching. 3-button placket.Solid jersey trim on inside placket and underside top placket.Available in X-Small, Small, Medium, Large, XL, 2XL, 3XL & 4XL! Let the temperature rise. You’ll stay cool and confident in our new bamboo charcoal sport shirt. With exceptional breathability and softness, this shirt is knit with bamboo charcoal to help regulate body temperature, wick moisture, fight bacteria and inhibit odor. It also resists UV rays to help keep you protected and comfortable.53/47 poly/poly from bamboo charcoal. Gently contoured silhouette. An eye-catching horizontal texture, a self-jacquard background and outstanding Dry Zone wicking performance make this new sport shirt a break from the norm. Lightweight with a fluid drape, it’s a relaxed—yet professional—addition to any wardrobe. Solid jersey insets show meticulous attention to detail.100% polyester. Gently contoured silhouette. Double-needle stitching. 100% spun polyester pique. Three horn buttons, clean-finished placket, bottom hem with side vents, half-moon yoke. Double-stitched for added strength. 2” extended tail. Meets ANSI 107-2004 requirements for background fabric.Available in Small, Medium, Large, XL, 2XL, 3XL, 4XL, 5XL & 6XL! 100% spun polyester pique. Three horn buttons, clean-finished placket, bottom hem with side vents, half-moon yoke. Double-stitched for added strength. 2” extended tail. Meets ANSI 107-2004 requirements for background fabric.Available in Large, XL, 2XL, 3XL, 4XL, 5XL & 6XL! Women’s 60% cotton/40% polyester short sleeve pique knit golf shirt. Features a v-neck collar and a square hemmed bottom with side vents. Women’s 60% cotton/40% polyester short sleeve pique knit golf shirt. The Contour features three horn buttons set in a reversed placket. Square hemmed bottom. Find the Stamina to take on anything that comes your way in this women’s 100% polyester waffle knit shirt, featuring the UltraCool™ system to control and manage perspiration. Accented with a fitted silhouette cut with a self-fabric collar and narrow 6-button placket. Small capped open sleeves, square bottom with side vents and contrast piping along inner back neck. Active lives require Ambition. Women’s 100% spun polyester micromesh golf shirt. Features the UltraCool™ system, developed to control and manage perspiration. Accented with a Johnny collar, square bottom with side vents and open cuffs. 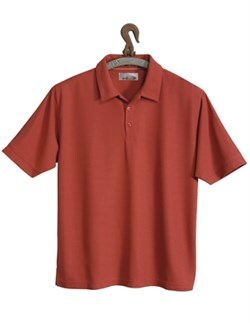 Men’s 60% cotton/40% polyester short sleeve pique golf shirt with clean-finished placket and three horn buttons. Features a hemmed bottom with side vents and a half-moon yoke. 2” extended tail.Available in Small, Medium, Large, XL, 2XL, 3XL, 4XL, 5XL & 6XL! 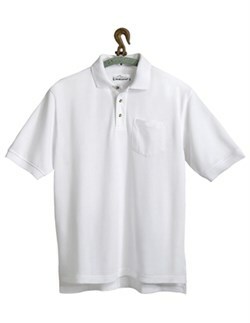 Men’s 60% cotton/40% polyester short sleeve pique golf shirt with clean-finished placket and three horn buttons. Features a hemmed bottom with side vents and a half-moon yoke. 2” extended tail.Available in Large, XL, 2XL, 3XL, 4XL, 5XL & 6XL! Whatever comes your way, there’s no need to sweat it.The Endurance waffle knit golf shirt is constructed of 100% polyester, and features the UltraCoolTM system to control and manage perspiration. Accented with a narrow 3-button placket, self-fabric collar and cuffs and square bottom with side vents. Khaki contrast piping along inner back neck.Available in Small, Medium, Large, XL, 2XL, 3XL & 4XL! 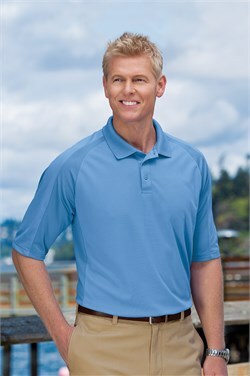 100% spun polyester micromesh golf shirt. Features the UltraCool™ system, developed to control and manage perspiration. Accented with a three-button placket, half-moon yoke back, and square bottom with side vents. Open cuffs.Available in Small, Medium, Large, XL, 2XL, 3XL & 4XL! 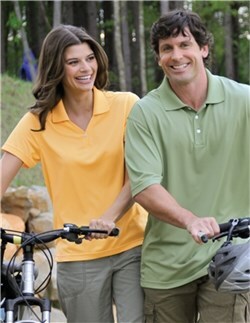 100% spun polyester micromesh golf shirt. Features the UltraCool™ system, developed to control and manage perspiration. Accented with a three-button placket, half-moon yoke back, and square bottom with side vents. Open cuffs.Available in Large, XL, 2XL, 3XL, 4XL, 5XL & 6XL! This lightweight, waffle knit golf shirt is perfect to wear in the boardroom or on the links, knowing youre in style and eco-conscious. The Premonition is constructed of 5.8 oz. 52% polyester/48% recycled polyester, and features Ultra cool moisture wicking technology. Accented with a narrow 3-button placket, self-fabric collar and cuffs and square bottom with side vents. Khaki contrast piping along inner back neck.Available in Small, Medium, Large, XL, 2XL, 3XL & 4XL! Comfort is taken to a whole new level with the naturally-insulting Climate shirt. 7 oz. 70% bamboo/30% cotton jersey golf shirt. Features Ultra Cool moisture wicking technology. Constructed with a coconut button placket, self-fabric collar, open cuffs and square bottom with side vents. Khaki contrast piping along inner back neck.Available in Small, Medium, Large, XL, 2XL, 3XL & 4XL! Womens 100% polyester textured jacquard 1/2 zip pullover shirt. features Ultra Cool moisture wicking technology. Contrast piping along front and back body, collar and placket. Mandarin collar and 3/4 sleeves. 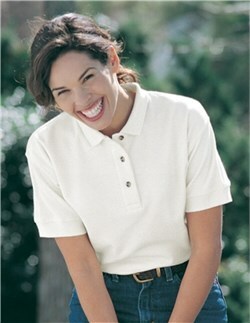 Women’s 60% cotton/40% polyester golf shirt. Special mesh knit stimulates air circulation. Featuring the UltraCool™ system, developed to control and manage perspiration. Two-tone trim Johnny collar and cuffs. Square bottom with side vents. 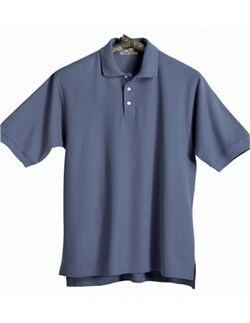 Men’s 60% cotton/40% polyester golf shirt. Special mesh knit stimulates air circulation. Featuring the UltraCool™ system, developed to control and manage perspiration. Two-tone trim collar and cuffs. Three horn buttons and half-moon yoke back. Clean-finished placket, bottom hem with side vents and 2 extended tail.Available in Small, Medium, Large, XL, 2XL, 3XL, 4XL, 5XL & 6XL! Men’s 7.8 oz. 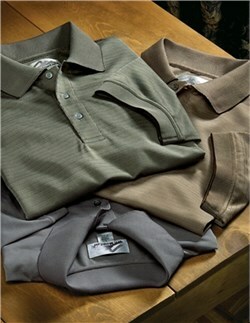 60% cotton/40% polyester golf shirt. Special mesh knit stimulates air circulation. Featuring the UltraCool™ system, developed to control and manage perspiration. Two-tone trim collar and cuffs. Three horn buttons and half-moon yoke back. Clean-finished placket, bottom hem with side vents and 2 extended tail.Available in Large, XL, 2XL, 3XL, 4XL, 5XL & 6XL! 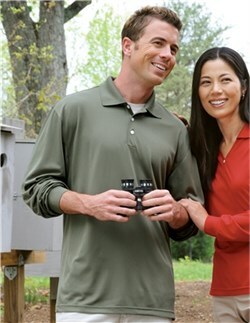 Men’s 60% cotton/40% polyester golf shirt with pocket. Special mesh knit stimulates air circulation. Featuring the UltraCool™ system, developed to control and manage perspiration. Two-tone trim collar and cuffs. Three horn buttons and half-moon yoke back. Clean-finished placket, bottom hem with side vents and 2 extended tail.Available in Small, Medium, Large, XL, 2XL, 3XL, 4XL, 5XL & 6XL! 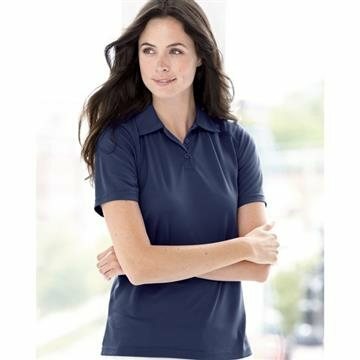 The perfect women’s pique golf shirt combining the easy care of a 60% cotton/40% polyester blend with 3M™ Scotchgard™ protection to resist stains. Contrasting trim on Johnny collar and cuffs. Features a square hemmed bottom with side vents. The perfect men’s pique golf shirt combining the easy care of a 60% cotton/40% polyester blend with 3M™ Scotchgard™ protection to resist stains. Constructed with a clean-finished placket and three horn buttons. Contrasting trim on collar and cuffs. Features a hemmed bottom with side vents and a half-moon yoke. 2” extended tail.Available in Small, Medium, Large, XL, 2XL, 3XL, 4XL, 5XL & 6XL! Keeping your cool regardless of conditions requires Vision. 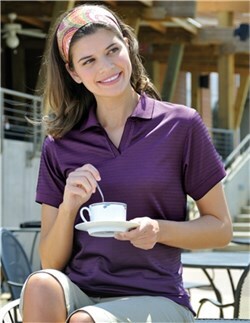 This Women’s 100% polyester pique golf shirt features the UltraCool™ system to control and manage perspiration. Constructed with one-button “Y” neckline, mesh side panels, and open cuffs. Square bottom with side vents. Go after everything you want with Vigor. 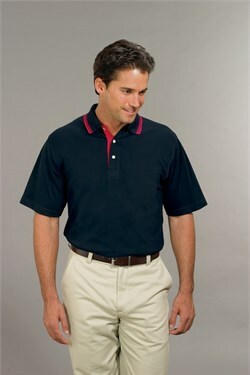 This Men’s 100% polyester pique golf shirt features the UltraCool™ system to control and manage perspiration. Constructed with a three-button placket, mesh side panels, and open cuffs. Half-moon yoke back and square bottom with side vents.Available in Small, Medium, Large, XL, 2XL, 3XL & 4XL! Go after everything you want with Vigor. 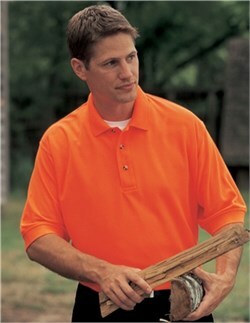 This Men’s 100% polyester pique golf shirt features the UltraCool™ system to control and manage perspiration. Constructed with a three-button placket, mesh side panels, and open cuffs. Half-moon yoke back and square bottom with side vents.Available in Large, XL, 2XL, 3XL, 4XL, 5XL & 6XL! Specially cut for women. 8.2 oz. 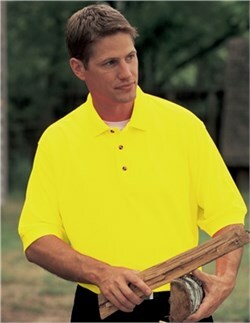 100% combed cotton pique golf shirt. Three horn buttons in reversed placket. Square bottom. Men’s 100% combed cotton pique. Three horn buttons. Clean-finished placket and bottom hem with side vents. Half-moon yoke. Double-needle stitched for added strength. 2” extended tail.Available in Small, Medium, Large, XL, 2XL, 3XL & 4XL! Men’s 100% combed cotton pique. Three horn buttons. Clean-finished placket and bottom hem with side vents. Half-moon yoke. Double-needle stitched for added strength. 2” extended tail.Available in Large, XL, 2XL, 3XL, 4XL, 5XL & 6XL! 100% combed cotton pique with left chest pocket. Three horn buttons. Clean-finished placket and bottom hem with side vents. Half-moon yoke. 2” extended tail. Double-stitched for added strength.Available in Small, Medium, Large, XL, 2XL, 3XL, 4XL, 5XL & 6XL! 100% combed cotton pique with left chest pocket. Three horn buttons. Clean-finished placket and bottom hem with side vents. Half-moon yoke. 2” extended tail. Double-stitched for added strength.Available in Large, XL, 2XL, 3XL, 4XL, 5XL & 6XL! 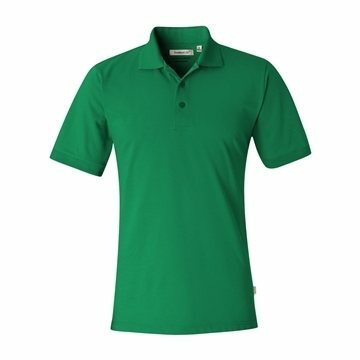 60% cotton/40% polyester pique golf shirt featuring the UltraCool™ system, developed to control and manage perspiration. Designed with a contrast piping along the collar, placket, cuffs and side panels for a unique, sporty look. Three horn buttons and half-moon yoke back. Clean-finished placket, bottom hem with side vents and 2” extended tail.Available in Small, Medium, Large, XL, 2XL, 3XL & 4XL! 100% combed cotton pique knit. Contrasting striped knit polo collar and cuffs. Clean-finished placket and hemmed bottom with side vents. Half-moon yoke. Three horn buttons. 2” extended tail. Double-stitched seams for added strength.Available in Small, Medium, Large, XL, 2XL, 3XL, 4XL, 5XL & 6XL! 100% combed cotton pique knit. Contrasting striped knit polo collar and cuffs. Clean-finished placket and hemmed bottom with side vents. Half-moon yoke. Three horn buttons. 2” extended tail. Double-stitched seams for added strength.Available in Large, XL, 2XL, 3XL, 4XL, 5XL & 6XL! 60% cotton/40% polyester pique knit featuring the UltraCool™ system, developed to control and manage perspiration. Jacquard knit collar and cuffs. Clean-finished placket and hemmed bottom with side vents. Half-moon yoke. Three horn buttons. 2” extended tail. Double-stitched seams for added strength.Available in X-Small, Small, Medium, Large, XL, 2XL, 3XL, 4XL, 5XL & 6XL! 60% cotton/40% polyester pique knit featuring the UltraCool™ system, developed to control and manage perspiration. Jacquard knit collar and cuffs. Clean-finished placket and hemmed bottom with side vents. Half-moon yoke. Three horn buttons. 2” extended tail. Double-stitched seams for added strength.Available in Large, XL, 2XL, 3XL, 4XL, 5XL & 6XL! Everyone’s favorite golf shirt – with an updated look and fabric. Womens 100% ring spun combed cotton baby pique. One-button “Y” neckline. Pearl button and square bottom with side vents. Everyone’s favorite golf shirt – with an updated look and fabric. Men’s 100% ring spun combed cotton baby pique. Three pearl buttons. Clean-finished placket and bottom hem with side vents. Half-moon yoke. Double-needle stitched for added strength. 2” extended tail.Available in Small, Medium, Large, XL, 2XL, 3XL & 4XL! Everyone’s favorite golf shirt – with an updated look and fabric. Men’s 100% ring spun combed cotton baby pique. Three pearl buttons. Clean-finished placket and bottom hem with side vents. Half-moon yoke. Double-needle stitched for added strength. 2” extended tail.Available in Large, XL, 2XL, 3XL, 4XL, 5XL & 6XL! Everyone’s favorite pocketed golf shirt – with an updated look and fabric. Men’s 100% ring spun combed cotton baby pique. Three pearl buttons. Clean-finished placket and bottom hem with side vents. Half-moon yoke. Double-needle stitched for added strength. 2” extended tail.Available in Small, Medium, Large, XL, 2XL, 3XL, 4XL, 5XL & 6XL! Everyone’s favorite pocketed golf shirt – with an updated look and fabric. Men’s 7 oz. 100% ring spun combed cotton baby pique. Three pearl buttons. Clean-finished placket and bottom hem with side vents. Half-moon yoke. Double-needle stitched for added strength. 2” extended tail.Available in Large, XL, 2XL, 3XL, 4XL, 5XL & 6XL! Men’s 100% combed cotton pique knit. Jacquard knit collar and cuffs. Clean finished placket and hemmed bottom with side vents. Half-moon yoke. Four horn buttons. 2” extended tail. Double-stitched seams for added strength.Available in Small, Medium, Large, XL, 2XL, 3XL, 4XL, 5XL & 6XL! Men’s 100% combed cotton pique knit. Jacquard knit collar and cuffs. Clean finished placket and hemmed bottom with side vents. Half-moon yoke. Four horn buttons. 2” extended tail. Double-stitched seams for added strength.Available in Large, XL, 2XL, 3XL, 4XL, 5XL & 6XL! 100% combed cotton pique knit with pocket. Features a jacquard knit design on the collar and cuffs, clean finished placket, hemmed bottom with side vents, half-moon yoke, four horn buttons, and 2 extended tail for easy styling. The double-stitched seams provide added strength and durability.Available in X-Small, Small, Medium, Large, XL, 2XL, 3XL & 4XL! For men who prefer a softer, less textured fabric, this subtle drop needle vertical stripe is a classic. The 60% cotton/40% polyester blend ensures easy care and great performance. Features a chest pocket, tipped collar, three horn buttons and a half-moon yoke back. Clean-finished placket, bottom hem with side vents and 2” extended tail.Available in Large, XL, 2XL, 3XL, 4XL, 5XL & 6XL! The perfect youth pique golf shirt, combining the easy care of a 60% cotton/40% polyester blend with a fabric protector to resist stains. Constructed with a clean finished placket and three horn buttons. Features a hemmed bottom with side vents and a half-moon yoke. 2” extended tail. The perfect women’s pique golf shirt combining the easy care of a 60% cotton/40% polyester blend with a fabric protector to resist stains. Features three horn buttons and a square hemmed bottom with side vents. The perfect men’s pique golf shirt, combining the easy care of a 7 60% cotton/40% polyester blend with a fabric protector to resist stains. Constructed with a clean finished placket and three horn buttons. Features a hemmed bottom with side vents and a half-moon yoke. 2” extended tail.Available in Small, Medium, Large, XL, 2XL, 3XL, 4XL, 5XL & 6XL! The perfect men’s pique golf shirt, combining the easy care of a 7 oz. 60% cotton/40% polyester blend with a fabric protector to resist stains. Constructed with a clean finished placket and three horn buttons. Features a hemmed bottom with side vents and a half-moon yoke. 2” extended tail.Available in Large, XL, 2XL, 3XL, 4XL, 5XL & 6XL! 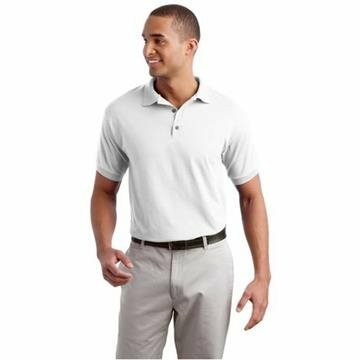 The perfect men’s pique golf shirt with pocket, combining the easy care of a 60% cotton/40% polyester blend with a fabric protector to resist stains. Constructed with a clean finished placket and three horn buttons. Features a hemmed bottom with side vents and a half-moon yoke. 2” extended tail.Available in Small, Medium, Large, XL, 2XL, 3XL, 4XL, 5XL & 6XL! 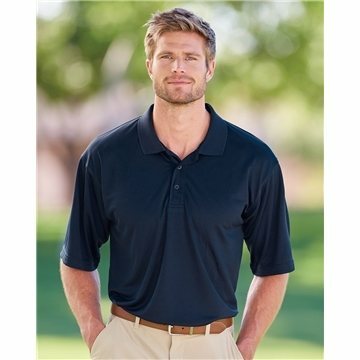 The perfect men’s pique golf shirt with pocket, combining the easy care of a 60% cotton/40% polyester blend with a fabric protector to resist stains. Constructed with a clean finished placket and three horn buttons. Features a hemmed bottom with side vents and a half-moon yoke. 2” extended tail.Available in Large, XL, 2XL, 3XL, 4XL, 5XL & 6XL! For women who prefer a softer, less textured fabric, this subtle drop needle vertical stripe is a classic. The 60% cotton/40% polyester blend ensures easy care and great performance. Features a tipped collar, v-neck, and square bottom with side vents. For men who prefer a softer, less textured fabric, this subtle drop needle vertical stripe is a classic. The 7.5 oz. 60% cotton/40% polyester blend ensures easy care and great performance. Features a tipped collar, three horn buttons and a half-moon yoke back. Clean-finished placket, bottom hem with side vents and 2” extended tail.Available in Small, Medium, Large, XL, 2XL, 3XL, 4XL, 5XL & 6XL! For men who prefer a softer, less textured fabric, this subtle drop needle vertical stripe is a classic. The 7.5 oz. 60% cotton/40% polyester blend ensures easy care and great performance. Features a tipped collar, three horn buttons and a half-moon yoke back. Clean-finished placket, bottom hem with side vents and 2” extended tail.Available in Large, XL, 2XL, 3XL, 4XL, 5XL & 6XL! For men who prefer a softer, less textured fabric, this subtle drop needle vertical stripe is a classic. The 60% cotton/40% polyester blend ensures easy care and great performance. Features a chest pocket, tipped collar, three horn buttons and a half-moon yoke back. Clean-finished placket, bottom hem with side vents and 2” extended tail.Available in Small, Medium, Large, XL, 2XL, 3XL, 4XL, 5XL & 6XL! 60% cotton/40% polyester variegated ribbon pique knit. Features a striped jacquard collar and cuffs. Constructed with a clean-finished placket, three horn buttons, and half-moon yoke. Hemmed bottom with side vents and 2” extended tail. Double stitched seams for added strength.Available in Small, Medium, Large, XL, 2XL, 3XL, 4XL, 5XL & 6XL! 7 oz. 60% cotton/40% polyester variegated ribbon pique knit. Features a striped jacquard collar and cuffs. Constructed with a clean-finished placket, three horn buttons, and half-moon yoke. Hemmed bottom with side vents and 2” extended tail. Double stitched seams for added strength.Available in Large, XL, 2XL, 3XL, 4XL, 5XL & 6XL! 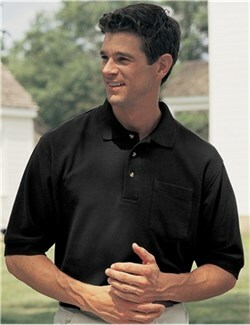 Men’s 60% cotton/40% polyester golf shirt with left chest pocket. Jacquard knit collar and cuffs with natural trim. Clean-finished placket and hemmed bottom with side vents. Half-moon yoke. Three horn buttons. 2” extended tail. Double-stitched seams for added strength.Available in Large, XL, 2XL, 3XL, 4XL, 5XL & 6XL!